George Payne has taken us all over northern, central and western New York. Today, George focuses on Lockport. What do convicted terrorist Timothy McVeigh, author Joyce Carol Oates, the inventor of volleyball, and Barry Goldwater’s 1964 vice presidential running mate all have in common? I bet you didn’t guess the city of Lockport, NY. The construction of the Erie Canal was authorized by the New York State Legislature in April 1816. The route proposed by surveyors was to traverse an area in central Niagara County, New York, which was then “uncivilized” and free of White settlers. At the time, the nearest settlers were located in nearby Cold Springs, New York. As it became known where the proposed canal was to be built, land speculators began to buy large plots along and near the proposed route of the canal. By December 1820, when the exact location of the step locks had been determined, the whole area of what would eventually become Lockport was owned by only fifteen men, many of whom were Quakers. The canal reached Lockport in 1824, but the locks were not completed until 1825. By 1829, Lockport had become an established village. The community was centered on the locks, and consisted mainly of immigrant Scottish and Irish canal workers, brought in as labor. The workers remained in Lockport after the completion of the locks, giving the city a heavy Celtic influence still discernible today, especially in the neighborhoods of Lowertown and North Lockport. The city of Lockport was officially incorporated in 1865. Marquis de Lafayette visits Lockport during his tour of the Erie Canal. 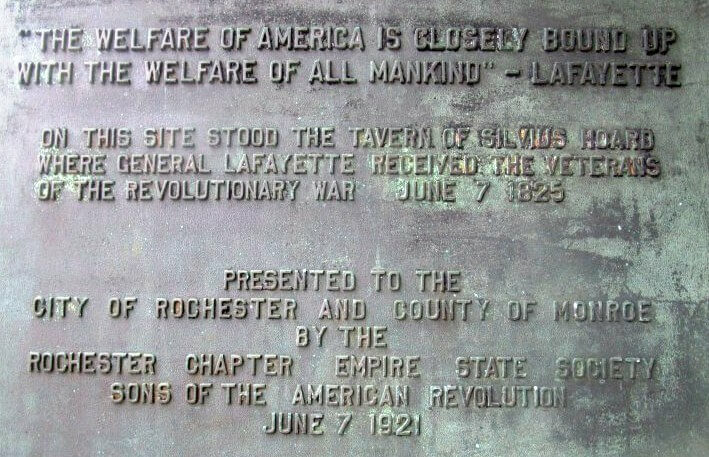 The next day, Lafayette is in Rochester. Former President John Quincy Addams visits Lockport during his congressional tour of western New York. Abraham Lincoln passes through Lockport en route to his inauguration in Washington. In April, 1865, President’s Lincoln’s funeral train passes through Lockport. The first volunteer regimen of the Civil War organizes in Lockport after a saloon owner learned about President Lincoln’s call for volunteers before official notice was given. The Holly Manufacturing Company was founded in 1859 in Lockport, N.Y., for the production of sewing machines, cistern pumps, and rotary pumps. Shop facilities doubled when Holly produced machinery for the Lockport water works system, designed by Holly to pump water under pressure directly into city mains without a reservoir. The system was applied by Holly in over 2,000 cities in the U.S. and Canada. By 1876, Holly’s interests shifted to the problems of heating buildings by steam. An experimental steam heating system tested in his home convinced Holly and others of the viability of wide-scale central steam heating, resulting in the 1877 founding of the Holly Steam Combination Company in Lockport. Heating systems using wood insulated pipe were installed in city businesses and eventually supplemented with a series of improvements covered by more than 150 patents issued to Holly between 1876 and 1888. Central steam heating systems of the Holly design spread to cities throughout the nation. In 1880 the Holly Steam Company was reorganized into the American District Steam Company, where Holly worked as principal and consulting engineer until his death. The Lockport Locks and Erie Canal Cruises boat rides are offered on the Erie Canal, with one proceeding upward through the modern locks for a short cruise, and returning to pass downstream under two lift bridges and then returning to the docks. The Lockport Erie Canal Museum is located in an old lock control structure between the modern Locks 34 & 35 and the remaining original “Flight of Five” Locks spillway and contains historic photographs, maps, engineering drawings and antique machinery. The Canal Discovery Center is housed in an old church about 100 yards to the west of the locks. Lockport has the widest bridge (399′ wide x 129′ length) in North America which spans the canal to the southwest of the locks. The Lockport Cave and Underground Boat Ride tour can be taken near the locks. The Niagara County Historical Society located at 215 Niagara Street. It is a complex of buildings that together tell the story of Niagara County history. 100 American Craftsmen is an annual show of arts and crafts held at the Kenan Arena. The arena is located on the historic Kenan Center campus. Ida Fritz park plays host to the Taste of Lockport every August and to a Cruise Night every Monday during the summer. Lockport has recently added a new ice rink for the Clarence Mustangs called Cornerstone Arena.